A selection of Mego celebrity dolls, circa 1977. from left I believe this doll is Jaclyn Smith, if anyone knows for sure who she is, please mail me!! She is wearing an original Cher outfit, "Dragon Lady". 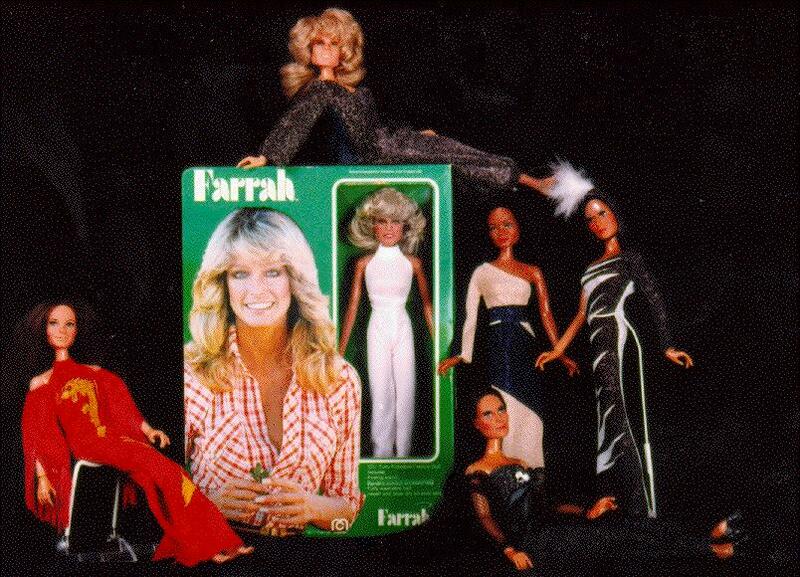 In the middle is a NRFB Farrah doll, with another Farrah with a slightly different hair color sitting on top of box. Next to Farrah is Diana Ross, wearing unknown Mego fashion, Cher, wearing an original Cher fashion, "Electric Feathers". Seated in foreground is Cher wearing an unknown Mego fashion.